"Primordial element" redirects here. For a concept in algebra, see Primordial element (algebra). In geochemistry, geophysics and geonuclear physics, primordial nuclides, also known as primordial isotopes, are nuclides found on Earth that have existed in their current form since before Earth was formed. Primordial nuclides were present in the interstellar medium from which the solar system was formed, and were formed in, or after, the Big Bang, by nucleosynthesis in stars and supernovae followed by mass ejection, by cosmic ray spallation, and potentially from other processes. They are the stable nuclides plus the long-lived fraction of radionuclides surviving in the primordial solar nebula through planet accretion until the present. Only 286 such nuclides are known. Because the age of the Earth is 7017144533808000000♠4.58×109 years (4.6 billion years), this means that the half-life of the given nuclides must be greater than about 7015315576000000000♠1×108 years (100 million years) for practical considerations. For example, for a nuclide with half-life 7015189345600000000♠6×107 years (60 million years), this means 77 half-lives have elapsed, meaning that for each mole (7023602000000000000♠6.02×1023 atoms) of that nuclide being present at the formation of Earth, only 4 atoms remain today.
. These are the 4 nuclides with half-lives comparable to, or less than, the estimated age of the universe. (In the case of 232Th, it has a half life of more than 14 billion years, slightly longer than the age of the universe.) For a complete list of the 33 known primordial radionuclides, including the next 29 with half-lives much longer than the age of the universe, see the complete list below. For practical purposes, nuclides with half-lives much longer than the age of the universe may be treated as if they really were stable. 232Th and 238U have half-lives long enough that their decay is limited over geological time scales; 40K and 235U have shorter half-lives and are hence severely depleted, but are still long-lived enough to persist significantly in nature. (7015110451600000000♠3.5×107 years). Taking into account that all these nuclides must exist for at least 7017145164960000000♠4.6×109 years, 244Pu must survive 57 half-lives (and hence be reduced by a factor of 257 ≈ 1.4 × 1017), 146Sm must survive 67 (and be reduced by 267 ≈ 1.5 × 1020), and 92Nb must survive 130 (and be reduced by 2130 ≈ 1.4 × 1039). Considering the likely initial abundances of these nuclides, possibly measurable quantities of 244Pu and 146Sm should persist today, while they should not for 92Nb and all shorter-lived nuclides. Nuclides such as 92Nb that were present in the primordial solar nebula but have long since decayed away completely are termed extinct radionuclides if they have no other means of being regenerated. Because primordial chemical elements often consist of more than one primordial isotope, there are only 83 distinct primordial chemical elements. Of these, 80 have at least one observationally stable isotope and three additional primordial elements have only radioactive isotopes (bismuth, thorium, and uranium). ). Other examples of common naturally occurring but non-primordial nuclides are isotopes of radon, polonium, and radium, which are all radiogenic nuclide daughters of uranium decay and are found in uranium ores. A similar radiogenic series is derived from the long-lived radioactive primordial nuclide 232Th. All of such nuclides have shorter half-lives than their parent radioactive primordial nuclides. Some other geogenic nuclides do not occur in the decay chains of 232Th, 235U, or 238U but can still fleetingly occur naturally as products of the spontaneous fission of one of these three long-lived nuclides, such as 126Sn, which makes up about 10−14 of all natural tin. There are 253 stable primordial nuclides and 33 radioactive primordial nuclides, but only 80 primordial stable elements (1 through 82, i.e. hydrogen through lead, exclusive of 43 and 61, technetium and promethium respectively) and three radioactive primordial elements (bismuth, thorium, and uranium). Bismuth's half-life is so long that it is often classed with the 80 primordial stable elements instead, since its radioactivity is not a cause for serious concern. The number of elements is fewer than the number of nuclides, because many of the primordial elements are represented by multiple isotopes. See chemical element for more information. As noted, these number about 253. For a list, see the article list of elements by stability of isotopes. For a complete list noting which of the "stable" 253 nuclides may be in some respect unstable, see list of nuclides and stable nuclide. These questions do not impact the question of whether a nuclide is primordial, since all "nearly stable" nuclides, with half-lives longer than the age of the universe, are primordial also.
. Similarly, all four primordial isotopes of lead are expected to decay to mercury, but the predicted half-lives are so long (some exceeding 10100 years) that this can hardly be observed in the near future. Nevertheless, the number of nuclides with half-lives so long that they cannot be measured with present instruments—and are considered from this viewpoint to be stable nuclides—is limited. Even when a "stable" nuclide is found to be radioactive, the fact merely moves it from the stable to the unstable list of primordial nuclides, and the total number of primordial nuclides remains unchanged. 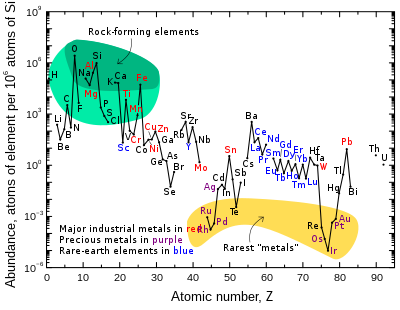 These 33 primordial nuclides represent radioisotopes of 28 distinct chemical elements (cadmium, neodymium, samarium, tellurium, and uranium each have two primordial radioisotopes). The radionuclides are listed in order of stability, with the longest half-life beginning the list. These radionuclides in many cases are so nearly stable that they compete for abundance with stable isotopes of their respective elements. For three chemical elements - indium, tellurium, and rhenium, a very long lived radioactive primordial nuclide is found in greater abundance than a stable nuclide. The longest-lived radionuclide has a half-life of 7031694267200000000♠2.2×1024 years, which is 160 trillion times the age of the Universe. Only four of these 33 nuclides have half-lives shorter than, or equal to, the age of the universe. Most of the remaining 29 have half-lives much longer. The shortest-lived primordial isotope, 235U, has a half-life of 704 million years, about one sixth of the age of the Earth and Solar System. A running positive integer for reference. These numbers may change slightly in the future since there are 163 nuclides now classified as stable, but which are theoretically predicted to be unstable (see Stable nuclide § Still-unobserved decay), so that future experiments may show that some are in fact unstable. The number starts at 254, to follow the 253 nuclides (or stable isotopes) not yet found to be radioactive. Nuclide identifiers are given by their mass number A and the symbol for the corresponding chemical element (implies a unique proton number). Mass of the average nucleon of this nuclide relative to the mass of a neutron (so all nuclides get a positive value) in MeV/c2, formally: mn − mnuclide / A. All times are given in years. Multiple values for (maximal) decay energy in MeV are mapped to decay modes in their order. ^ D. C. Hoffman; F. O. Lawrence; J. L. Mewherter; F. M. Rourke (1971). "Detection of Plutonium-244 in Nature". Nature. 234 (5325): 132–134. Bibcode:1971Natur.234..132H. doi:10.1038/234132a0. ^ S. Maji; S. Lahiri; B. Wierczinski; G. Korschinek (2006). "Separation of samarium and neodymium: a prerequisite for getting signals from nuclear synthesis". Analyst. 131 (12): 1332–1334. Bibcode:2006Ana...131.1332M. doi:10.1039/b608157f. PMID 17124541. ^ P.K. Kuroda (1979). "Origin of the elements: pre-Fermi reactor and plutonium-244 in nature". Accounts of Chemical Research. 12 (2): 73–78. doi:10.1021/ar50134a005. ^ H.-T. Shen; et al. "Research on measurement of 126Sn by AMS" (PDF). accelconf.web.cern.ch. ^ "Interactive Chart of Nuclides (Nudat2.5)". National Nuclear Data Center. Retrieved 2009-06-22.